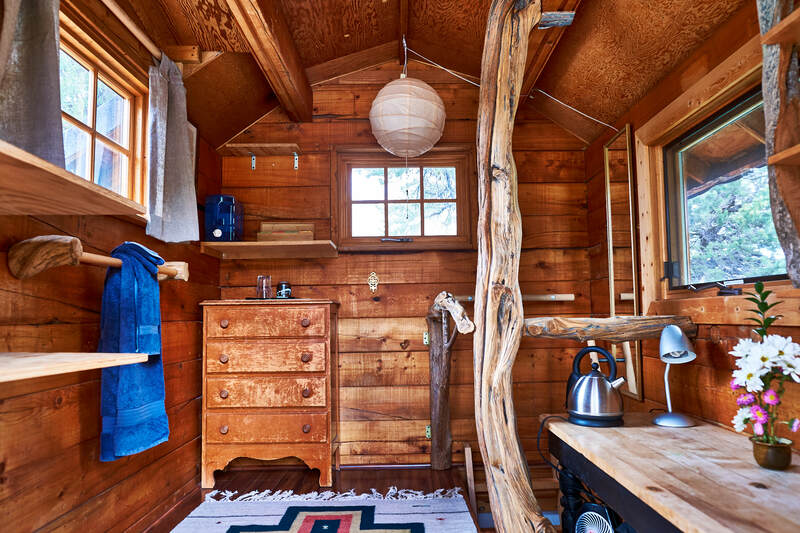 The Young Pine Hut is a cozy rustic two-story log cabin. Upstairs there is a sitting area with a low desk, dresser, and a tea station. A ladder leads down to the lower floor where there is a single lofted bed with shelving below. 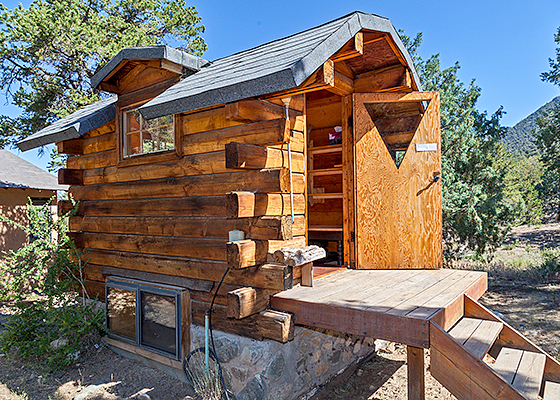 This heated cabin can accommodate one person. There is no running water in the cabin. The Guest House bathrooms are 50 yards away. Crestone Retreats sends out announcements and special offers for individual guests. To be added to the Crestone Retreats mailing list, please fill out your information below. We do not share our e-mail addresses with any other organization. You can read more about our Privacy Statement here. Crestone Mountain Zen Center has a separate mailing list for our Zen programs. If you would like to receive be added to the CMZC mailing list, please select the box below. There is a variety of mineral hot springs in the San Luis Valley. Guests at the Crestone Mountain Zen Center can reach these destinations by car within 30-50 minutes to the north and south. The hot springs are part of a geological fault system that created the dramatic visual appearance of the precipitous and linear Sangre de Cristo mountain range. Located at the northern gateway to the San Luis Valley is Joyful Journey Hot Springs, about 35 minutes from Crestone Mountain Zen Center. There are three outdoor tiled geothermal soaking pools with different temperatures, surrounded by decks and magnificent panoramic views of the Sangre de Cristo mountain range. The facilities include a sauna, and you can schedule a massage while visiting. This should be your pick if you like hot (!) water and a quiet atmosphere for soaking. Just a little further to the north (50 minutes from our Center), tucked against the mountains, is Valley View Hot Springs operated by the Orient Land Trust, an organization dedicated to natural resource preservation. We affectionately call Valley View the “warm springs,” because some of the pools are just above body temperature. The setting is most beautiful! Some of the natural hot water pools are right in the river itself. Valley View also offers a chlorine free swimming pool, hot tub, and sauna. The entire grounds are clothing optional. If you visit Valley View in the afternoon, you can combine it with a hike to the Orient Mine, which is home to a colony of 250,000 migratory bats. It is a spectacle when the bats in what seems like an endless stream of fluttering bodies swarm out of the mine at dusk to go hunting for insects in the valley. The Sand Dunes Swimming Pool is located near the small town of Hooper, about 40 minutes away from the Center. This is a great destination if you want to do some swimming in a bigger warm pool (98-102 degrees depending on the season). There is also a soaking pool at 118 degrees and a 24-person therapy pool at 108 degrees. Adjoining is an adults-only Greenhouse with a variety of hot pools in between the plants. They serve beer and and wine there! There is first-class hiking all around the Center with trails starting right at the campus, which is surrounded by 240 acres of piñon pine and juniper forest. On campus, we have created a network of easy trails that the resident monastic community uses for walking meditation. Off campus, there is a multitude of trail options leading up into the high country or along the streams into the valley. Behind the campus the land rises steeply into the mountains bordering Rio Grande National Forest land. Behind and above the whole property, lifting into another world of weather and spirit, are five impressive fourteen thousand foot peaks: Crestone Peak and Crestone Needle, Kit Carson, Challenger, and Columbia Point. Along the north border of our campus you can walk up Spanish Creek Trail into a verdant aspen and spruce covered canyon or, further to the south, hike up South Spanish Creek Canyon to the top of Chinese-scroll-looking rocky peak called Dragon’s Rock that dominates the view from the campus. Spanish Creek trail leads all the way up to the ridge, the Bear’s Playground, from where climbers have access to the so-called Prow, a technical route to Kit Carson Peak. About a mile to the south, you find the beautiful Cottonwood Creek trail that give access to Cottonwood Lake as well as Crestone Peak and Crestone Needle. Directly above the town of Crestone, three well-maintained trails along Willow Creek, South Crestone Creek and North Crestone Creek take you to three mountain lakes and spectacular vistas. Kit Carson, Challenger Point and Columbia Point are most conveniently accessed from here. The Crestone Area is home to some 25 spiritual practice communities representing most of the major wisdom traditions of the world. Many of them welcome guests and day visitors. We have ongoing neighborly relationships with most of the Spiritual Centers in Crestone. If you want to go a tour or would like a personal introduction to a specific Center, we are happy to help. In 1979, the Manitou Foundation began to provide land grants and financial support in the Crestone Area to spiritual leaders and organizations, to ecological and environmental sustainability projects, and to related educational endeavors. The vision was to create an inter-faith community for contemplative practice as a framework for the transformative evolution of the human body and mind. 40 years later, some of these groups meet in private homes, some own land with plans to build, and some like the Crestone Mountain Zen Center have developed larger facilities that allow for communal residential practice, reclusive solo retreats, large gatherings, or short individual retreats. To visit the temples and shrines of the larger communities, it is advisable to call or email ahead of your intended visit. For an introduction to Crestone as a place of natural beauty and spiritual retreat, check out “A Place of the Heart,” a short movie by local film makers, in which some of the local spiritual practitioners speak about their sense of place. Our Zen kitchen practice has been transmitted from Tenzo (Head of the Kitchen) to Tenzo for more than 50 years. It stretches back to the San Francisco Zen Center and its pioneering Greens Restaurant, which was opened in 1979 by our current Abbot Zentatsu Baker Roshi and founding chef Deborah Madison. Greens has been rooted in a farm-to-table philosophy since its inception and played an instrumental role in introducing fine vegetarian dining to America. We are proud to continue this lineage. We use primarily organic ingredients and source locally as much as possible. As part of our Ecological Transformation Initiative, our current effort is to deepen our cooperation with local farmers and help support a local San Luis Valley food system. Making a commitment to homegrown and local food is an essential ingredient to our vision of developing our Retreat Center as an ecologically responsible, sustainable and regenerative community that embodies the change the world urgently needs. In the summer a good portion of the produce comes from our own 2500 square foot vegetable and fruit gardens. Almost everything we serve is homemade. We continually develop and experiment with food processing and preservation methods such as fermentation, canning, and dehydration. On a daily basis we make and serve a variety of fresh breads, milk products like yogurt and kefir, and spreads ranging from fruit preserves to nut butters.